LISTEN NOW! This is an update to a previous story “The FUTURE of Technology is now- from New Google Glasses to 3D Printing of Body Parts” Where this 3D printer has been used in making live tissue to reconstruct body parts such as ears. 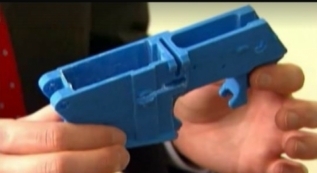 Now CBN reports that a Law Student has apparently created a plastic gun using this same printer and has the State Department up in arms citing international arms control laws and congress asking to have these guns made illegal. Greg shares that God is the creator and we are made in his image and likeness and therefore we to are creative beings. But just because we can, doesn’t mean we should. During the time of the Tower of Babel, people were able to accomplish many things. But God scrambled their language and scattered them. He did a reboot. Is our nation heading towards a reboot?